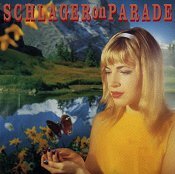 In Music We Trust - Schlager on Parade: Arizona Man 7"
Schlager on Parade serve up sweet German chocolate, er, pop music on this 7". Backed with "Eine Hutte In Den Baumen," Schlager deliver sweet, mountain air fresh pop melodies and sweet, low key, soft rhythms that will put you in happy land when you're in your slumber. The words are hard to understand (since they're in German), and though the pop is sweet, it's not that accessible. But it's so bright and warm; you can't help but be at least a bit turned on by it. I'll give it a C.